First and foremost: There's an important International Fine Arts Glass Show coming to the DMV. This event's start is a bit complex, so pay attention! The British sister city to Washington, DC is Sunderland. Why Sunderland and not London? After all, most other sister cities to DC are the capitals of other countries - but Sunderland is George Washington's ancestral hometown, so that's why! Sunderland is also where the United Kingdom has their National Glass Centre and, by the way, glass has been made in Sunderland for around 1,500 years. George Koch is one of the District's true art icons: he's a talented painter, the founder of A. Salon, Ltd., a board member of the Cultural Development Corporation, a founding board member of the Cultural Alliance of Greater Washington, a Commissioner of the DC Commission on the Arts and Humanities, board member of Hamiltonian Artists, and the Board Chair of Artomatic. They don't get much bigger, influential, or harder working for the District's artists and arts organizations than George Koch. And George has been working very hard to get the British to bring the United Kingdom's premier glass artists to an exhibition in the US, while at the same time bring some attention to the many and talented glass artists working around the Greater DC region. So Koch has been orchestrating the process to bring the Brits to DC in a major show, somehow tie it to the Artomatic organization, use it to showcase Washington area glass artists, and also tie the whole effort into a nascent Toledo, Ohio Artomatic-type organization. If you paid attention in art school, then you know that Toledo, Ohio is also historically one of the glass centers of the colonies, and an important placeholder in art history. 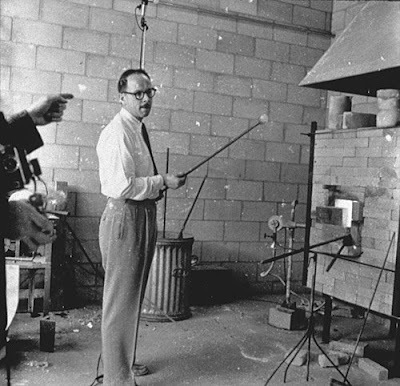 In 1962, Harvey Littleton, Professor of Art at the University of Wisconsin, (and DC gallerist Maurine Littleton's father) and Dominick Labino (a glass scientist with the Johns-Manville Fiber Glass Corporation), presented a glass workshop in conjunction with the Toledo Museum of Art. These men are recognized internationally as the "fathers" of the American Studio Glass Movement and certainly the first two to take the seminal steps to bring glass from the high end crafts to the fine arts world. Convinced that it was finally possible for an individual artist to undertake glass art by working entirely alone - as compared to being part of a glass factory, Littleton and Labino provided information on furnace construction, glass formulas, tools, techniques, etc. They sowed the seeds that eventually sprouted thousands of individual kilns, furnaces and glass studios and schools around the United States and the world. The Toledo workshop was the beginning of the American Studio Glass Movement. Since then, American glass artists are acknowledged worldwide as the undisputed leaders in creativity and originality and the continuing battle to bring glass to the fine arts dialogue. The final key player in this showcase of three glass centers is the Washington Glass School, bringing to the show about 15 area glass artists who are instructors of the now nation wide famous content-driven art glass facility. Bottom line: a historic event is about to take place in Washington, DC. Three educational leaders in today's Contemporary Art Glass movement are joining forces to present a representative survey of the exciting artists and techniques surfacing at these three facilities. Two of these institutions, the Toledo Glass Pavilion and Sunderland Glass School represent hundreds of years of a rich glass-making tradition while the Washington Glass School has emerged as a new and vibrant player on this field. The show will take place at Georgetown Park Mall in Washington, DC from February 21, 2008 to March 16th, 2008 and this "International Glass Invitational" will be presented as a partnership with Art-O-Matic, the Sister City Program, etc. The opening date is set to coincide with the birthday of George Washington. The talented and ubiquitous Mark Jenkins is interviewed in the current issue of Juxtapoz Magazine. Check out some of Mark's amazing videos of his street art and what they do to people... here. I have been captivated by James Hampton's "The Throne of the Third Heaven of the Nations' Millenium General Assembly" at the Smithsonian American Art Museum for about a decade. I think partly because it was closed-off for so long and I began to miss seeing it. It was the first piece of Folk or Visionary Art that I fell in love with. I like art that expands how we define it, and challenges who can create it. I like how the piece is so unselfconscious and at the same time ambitious. I like how it uses what some might see as trash to express a high spiritual calling. And I like how seeing it in a museum makes me think, "hey, maybe my stuff it good enough to be here too."